A hip implant designed by Yorkshire healthcare company JRI Orthopaedics has powered a patient to win a sprint triathlon just 12 weeks after having replacement surgery. 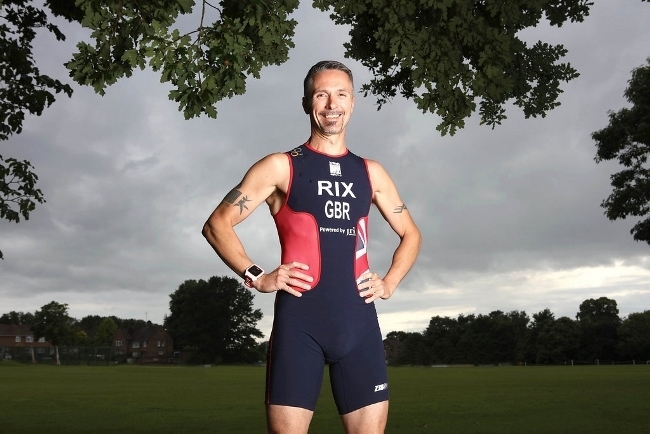 Michael Rix thought his competitive running career was over when he developed the bone disease in his left hip at the age of 40. But an implant developed by Sheffield-based JRI Orthopaedics has helped ensure he is back competing at the highest level as a Team GB athlete – winning a silver medal in the 2015 World Duathlon Championships. Michael, from Pulborough in West Sussex, was a UK Championship marathon runner and triathlete and competed regularly in half and full Iron Man events. “I was running 100 to 120 miles a week at one point and felt like I was invincible, but then one day I got out of bed and found I could not put my sock on,” he said. For the next two years the Dad-of-one was in increasing pain and X-rays revealed his left hip was riddled with osteoarthritis. A hip replacement was the only answer. Michael was referred to leading orthopaedic surgeon Kerry Acton at the Royal Surrey County Hospital who used a Furlong Evolution implant designed and manufactured by JRI Orthopaedics. JRI was the first in the world to develop a Hydroxyapatite ceramic coating on hip replacements – a synthetic version of the natural mineral present in bones. By perfecting this coating process, JRI was able to produce cementless implants that bond biologically with the patient’s own bone, providing for long-term secure fixation and the possibility of a hip for life. Two weeks after surgery Mike was cycling on a static bike and swimming, and three months later he beat 105 competitors to win the Dorney Lake Super Sprint Triathlon. That was three years ago. Since then Mike, 45, has just got faster representing Team GB in the last two European and World Duathlon Championships – winning a silver medal in his age group at the 2015 Worlds event in Adelaide. “Although my long distance running career was over the new hip has enabled me to compete in multisport events like sprint duathlons and triathlons at a very high level, which has just been amazing,” added Michael. There has been a major increase in the numbers of younger people having hip replacements. A recent report by the Royal College of Surgeons revealed a staggering 76 per cent rise in the last ten years in people under 60 who have had hip replacement surgery. Mr Acton said: “Twenty years ago patients like Mike would have been told to give up sport and wait, in pain, until they were in their 60s or 70s. “What makes hip implants fail is bearing wear and breakdown of the interface between the bone and the implant. Today, the biological bond in the best uncemented hip means we have prostheses that offer great durability and longevity. JRI Orthopaedics has a long-established reputation for innovation and is wholly owned by the charity, Orthopaedic Research UK (ORUK). The company Gift Aids the majority of its operating profits to ORUK to fund independent research into bone and joint disease and an expanding medical education programme. Acceleris “agency of the year” title – again!